Ken Anderson, over at Dreams Are What Le Cinema Is For, turns in a thorough — and I mean thorough! — tribute to The Poseidon Adventure (1972), one of the most beloved disaster flicks of all time. For me, it's allll about Shelley Winters (1920-2006), but there is no weak link. In the 1972 shout-fest X, Y and Zee, Elizabeth Taylor has the line:“I may be the worst thing in the world, but I carry it in front where you can see it!” Well, if The Poseidon Adventurecould speak, that would be its mantra. It’s old-fashioned, schlocky, and loaded with what director Ronald Neame (The Prime of Miss Jean Brodie) labeled “cardboardy” characters; but the film carries it all out in front where you can see. 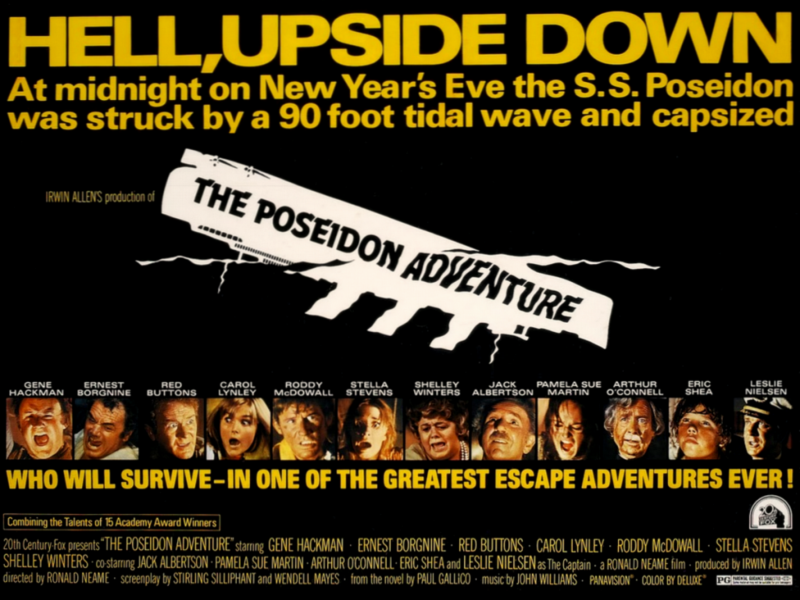 The Poseidon Adventure, a 20th Century Fox film, wears its corniness proudly on its sleeve. It’s a big, family-friendly film that was a conscious thumb of the nose to the incoherence (Fox’s Myra Breckinridge -1970), drugs (Fox’s The Panic in Needle Park -1971), and vulgarity (Fox’s Beyond the Valley of the Dolls - 1970) of New Hollywood.